Anne Humphries offers a guide to the war graves in Alvechurch. Servicemen who died as a result of World War I or II and who are buried in war graves in St Laurence churchyard, Alvechurch, are remembered in November by the placing of poppy crosses on their graves. It was decided that bodies of men who died abroad would not be repatriated, and that all should be treated in the same way regardless of rank and have the same white headstone of Portland stone. This also applied to the many men who died in the UK from wounds or illness resulting from service abroad, or those who served at home, having been found to be unfit for foreign service. There are seven war graves in the churchyard, three from World War I and four from World War II. Six are the traditional Portland stone Commonwealth War graves; the seventh is a family grave. * Thomas Davis Private, Labour Corps. Son of Thomas and Elizabeth Davis, of Birmingham Road, Alvechurch. Died from bronchitis and pneumonia aged 35 on 18th November 1918 at Cliveden Hospital, Taplow; buried on 23rd November 1918. Thomas had done war work at the Birmingham Gas Company and on the land; before enlisting he was a highly respected member of the church choir. * Thomas Trueman Private, Labour Corps. Son of William and Mary Trueman, of Withybed Green, Alvechurch; husband of Edith Trueman, 27 Mill Lane, Northfield, Birmingham. Died aged 37 on 28th December 1918 at Sobraon Military Hospital, Colchester; buried on 4th January 1919. * Roland Matthews Private, 13th Battalion Australian Infantry Australian Imperial Force. Son of Richard and Mary Ann Matthews, of Poolbank, Cofton, Northfield, Birmingham; born at Alvechurch. Died of wounds on 2nd January 1918 in the Tankerton Military Hospital, Whitstable, Kent, aged 27. Buried on 8th January 1918. Roland had emigrated to Australia but the consequences of war saw him return to England, buried next to his family. 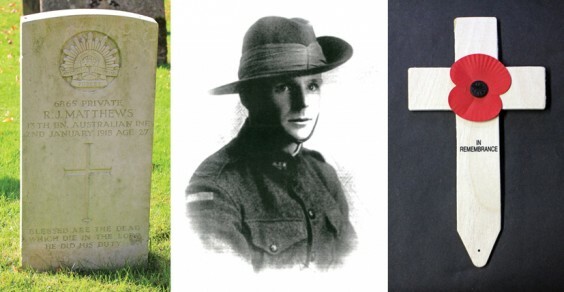 Pictured above: Roland’s grave, a portrait of him and a poppy cross. * Harry Busby Private, 1st Battalion Worcestershire Regiment. Son of Henry and Margaret Busby, of Barnt Green, Worcestershire. A despatch rider, he died in hospital in Kent aged 21 on 13th May 1944 following an accident. * William Price Company Quartermaster Sergeant, 8th Battalion North Staffordshire Regiment. Died on 11th October 1941. * Alfred Reading Ordinary Seaman, H.M.S. Argus Royal Navy. Son of John and Ellen Reading of Alvechurch and husband of Millicent Amelia Daisy Reading, of Alvechurch. Died aged 35 on 10th June 1947. * William Keeling Lance Corporal, Royal Army Service Corps. Husband of J Keeling, of Alvechurch. Died on 23rd November 1940 in Ireland. After the war it was decided to bring an unidentified body from France, which could serve as a symbol for the families whose loved ones were buried abroad or who had no known graves and were simply listed on one of the huge memorials to the missing such as Thiepval or Tyne Cot. Lieutenant-Colonel Edward Anthony Gell M.C., son of a one-time rector of Alvechurch, Francis Gell, was Deputy of the then Imperial War Graves Commission and assisted with the process of selection of this Unknown Warrior. The chosen body was returned to England and was buried in Westminster Abbey on 11 November 1920 when thousands of people lined the streets to see it pass. Anyone who wishes to join in the placing of the poppy crosses should meet at the porch of St Laurence Church on Sunday November 15 at 3pm.